Oxford Street is London’s central shopping street where you can find most of Britain’s major department stores. It’s also a major traffic thoroughfare, which leads to traffic jams like you wouldn’t believe – usually buses and taxis as far as the eye can see. Occasionally they have had traffic free shopping days which have been popular. Now, London’s new Mayor Sadiq Khan is going all the way and has announced that they’ll be pedestrianizing Oxford Street by 2020 to clean up London’s air and remove the traffic headache altogether. 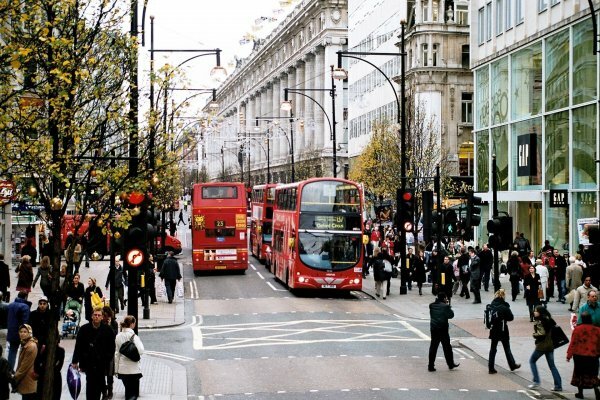 Oxford Street will be pedestrianised by 2020, the mayor of London’s office has said. All traffic including buses and taxis will be banned from the shopping street – one of the most famous in the world – as part of Sadiq Khan’s plans to tackle air pollution. More than four million people visit Oxford Street each week.City Hall said the project would be rolled out in two stages to reduce disruption on the 1.2-mile street. Cars are already banned on most of Oxford Street between 07:00 and 19:00 every day apart from Sunday. Valerie Shawcross, London’s deputy mayor for transport, told the London Assembly on Wednesday that the plan was to ban all traffic along Oxford Street from Tottenham Court Road as far as Marble Arch. The ban will first be implemented on the eastern section, between Tottenham Court Road and Oxford Circus, she said. A spokesman said the project would contribute to the mayor’s aim of improving air quality and make Oxford Street “a far safer and more pleasant place to visit”. I think this is fantastic news and I can’t wait to see it in action. Cool! I’ll be able to breathe when I visit. Great! Hardly wait to see it happen! All I can say is FINALLY!!! I said this the first time I walked that street 20 years ago! Now if we can get more sidewalk cafes & neat places to eat, it will be a perfect destination for shopping. Looking forward to it! Gawd, I hope they have REALLY studied this. Every single “pedestrianization” plan I have ever seen has failed. Instead of increasing foot traffic, it always chokes it off because people can’t get to the stores. I know this is Oxford Street, and obviously no traffic most days has not hurt it… but cabs and buses are still running. Obviously there are the three major Tube stops, Tottenham Court, Oxford Circus, Marble Arch, so people keep flowing. I really hope this works.